"Singing is and always will be a part of my life." Isabel loved to sing! From a young age, Isabel, her parents and siblings sang regularly together. They were all very talented and had beautiful voices. She used her voice whenever she could and loved to share her talent with family and friends. Her sons, Andre and Raymond, have countless memories of their mother singing to them. She had a particular fondness for traditional Scottish music, with "These are My Mountains" being one of her favourites. These memories and the sound her voice will remain with her family forever. Isabella Smith Orr Craig was born in Rutherglen, Scotland on May 24, 1943 to parents Andrew and Nancy (Orr) Craig. In time she was joined by younger siblings Sandra (1947) and Drew (1953). Isabel and her family spent the first 13 years of her life in Rutherglen before the entire family immigrated to Canada in 1956. They soon settled in Toronto where Isabel completed her high school education. Following school, Isabel began working as a nurse’s aid at Northwestern General Hospital in Toronto. Here she meet a young man by the name of Marcel Coulombe, who also worked at the hospital as an orderly in the O.R. Their first date was October 31, 1963 and they attended a Halloween dance together. As they say the rest is history and the young couple were married on January 16, 1965 in Weston, Ontario. Isabel and Marcel welcomed their sons Andre in 1966 and Raymond in 1967. Life with a young family was busy for Isabel. The boys were on skates at three and playing hockey shortly after. She loved her time at the rink, supporting and cheering on her boys every opportunity she could. Isabel also enjoyed spending time crocheting, knitting and who could forget her collections. She had a particular fondness for collecting fairy figurines, stuffed animals and dolls. When not busy with these pastimes she was usually packing or unpacking. Her and Marcel moved a total of 29 times during their marriage. Imagine! Isabel loved to read. She owned 100's of books over the years and had a fondness for Harlequin Romances and anything written by Danielle Steele, her favourite author. Isabel also loved to read her Bible. She read it cover to cover multiple times as her faith was extremely important to her. When it came to TV, she was always tuned in to “Murder She Wrote” and kept up with all the Soaps. When in the kitchen, Isabel was renowned for her spare ribs and homemade bread. After the boys left home, she was always kept company by one of her four-legged friends. Over the years a variety of dogs, cats and even a budgie called the Coulombe residence home. In her families words Isabel "sang like an angel." However, Isabel was extremely close with her mother and the day her mother died the singing stopped. Her heart was broken and Isabel never sang again. Soon after, her health began to decline, several major surgeries followed and finally dementia. Marcel cared for his wife dearly and was able to keep her at home with him until February 2017 whereby she moved to Hanover Care Centre for further care. Isabel went to be with her Lord on the morning of Thursday, August 23, 2018 at the age of 75. Beloved wife of Marcel. Cherished mother of Andre of Paisley and Raymond (Kelly) of Nobleton. Isabel will be fondly remembered by her granddaughters Samantha, Jayme and Virginia, sister Sandra (Bob) Beattie of Hastings and brother Drew (Pamela) Craig of Midland. She was predeceased by her parents Andrew and Nancy (Orr) Craig. A memorial visitation will be held at Rhody Family Funeral Home, Chesley on Sunday from 2 – 4 p.m., where a celebration of Isabel’s life with be held on Monday, August 27, 2018 at 1 p.m. Inurnment in Chesley Cemetery. Memorial donations to the Alzheimer Society would be appreciated as expressions of sympathy. Our deepest condolences to you, Marcel and the family! May the fond memories of your Isabel provide some comfort. 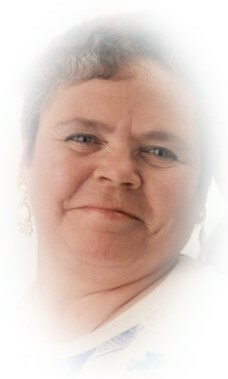 May Isabel soar and sing with the angels as she walks along side each of you kept alive by the memories you all share. Thoughts and prayers are with you Marcel and your family in the loss of your love, Isabel and the Mother of your boys. So sorry to hear about your loss. Thinking of your family during this difficult time. I'm so sorry for your loss, all my sympathy to the family in this hard time. Our thoughts and prayers to out to you Marcel and your family in this time of loss. Many fond memories and Isabel will be missed.